by wangdu on April 3, 2019 in Events, News. We are glad to share with you the great news that Guru Vajradhara the 12th Chamgon Kenting Tai Situpa has accepted Palpung Dharma Chakra Association’s request to give a six-day teaching in Portugal. 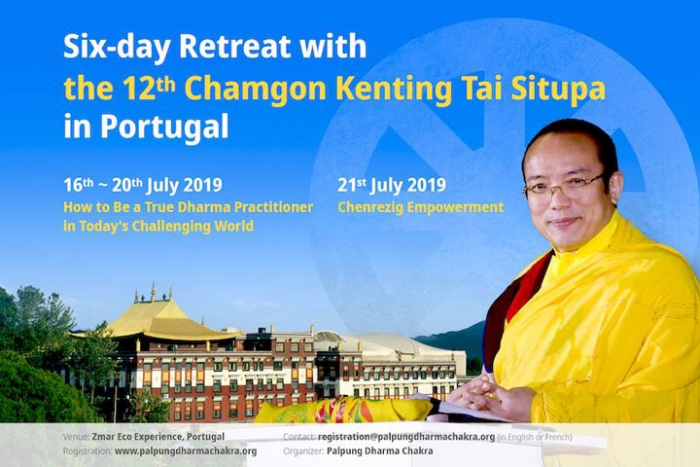 This is the 12th Chamgon Kenting Tai Situpa’s first teaching in Europe in twenty years and the teaching is open to anyone who is interested in the Dharma. Subject: How to be a true Dharma practitioner in today’s challenging world. Venue: Zmar Eco Experience in Odemira, Portugal. Kindly contact: registration@palpungdharmachakra.org for further information.